NOTE: Most of these web pages were originally set up for important political events that took place in Summer 2009. They have been excerpted from a prior website. Now 33 years old, Aakash is involved in the political and technology consulting arena. For an updated overview of his proficiencies, please check out his LinkedIn profile. Check out Aakash Raut's current work experience and skills. A resume (PDF) is available here. Aakash is available for consulting opportunities. Aakash Raut has been recognized, over the past decade, as one of the top conservative & GOP youth leaders in the United States. For details on his experience, background, qualifications, and recognitions, please see his accomplishments as a GOP youth leader, the awards and titles he has held, and a partial selection of photos, from events all over the country, to which he has led major student delegations. Aakash was born in New York City, but was raised in the Illinois capital (Springfield), right in the heart of the "Land of Lincoln" - and a nexus of Midwestern politics and policymaking - where he has lived for the past 23 years. It was in 5th grade that he first identified himself as a conservative, as he watched the 1992 national elections, and learned more and more about current affairs and issues. An alumnus of Springfield High School, he has long been involved in a variety of student organizations and activities, winning competitions and awards at the local and statewide level. In addition to being a Captain of the Scholastic Bowl Team and a successful "Original Oratory" competitor on the Speech Team, he served as the President of the Math Club, Secretary of the Key Club (Kiwanis International), was twice elected to the Student Council, and was a charter member of a groundbreaking student technology organization (which, among other "benchmarks," established one of the first school-district internet systems in Illinois). It was during high school that Aakash also held his first political job, as an intern in the Legislative Office of his U.S. Congressman, during the Election 1998 period and Clinton impeachment (over which his Congressman presided, for the historic action). After graduating from SHS, and first attending a different U of IL campus, Aakash transferred back to the capital city, where he earned an Associates Degree from Lincoln Land Community College, and a Bachelors in Political Science from the University of Illinois at Springfield (UIS). In addition to College Republicans (in which he was Secretary and 1st Vice-Chairman before being elected Chairman), Aakash was the Founding Treasurer of the Society of Conservative Students (SCS) at UIS, and was also active in Christian Student Fellowship (CSF) and Delta Sigma Omicron (disability awareness club). 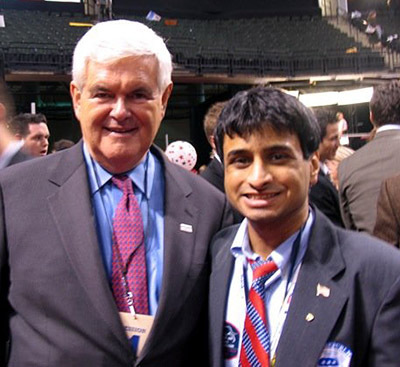 Aakash was greatly-involved in politics, public policy advocacy, and election campaigns, even before he became Chairman of the UIS College Republicans. He was highly active in Election 2000 (both in the primary and general elections), in Election 2001 (where he was the top campaign aide for a City Council contender), in the 2001-2002 Primary Election season (gubernatorial and U.S. Senate races), in the 2002 General Election (races for Attorney General, U.S. Congress, and State Representative), and involved in the 2003-2004 U.S. Senate primaries as well. Here is an overview of his subsequent activites, after being elected to lead his CR organization (term began June 1st, 2004; he served 3 total years as Chairman + 1 as Executive Director). A selected list of candidate campaigns Aakash has consulted or volunteered on is available here. In addition to being a veteran of election and policy campaigns (at the federal, state, county, and local levels), Aakash has worked at the Bank of Springfield, St. John's Hospital, and the Illinois State Museum. He has recently begun a freelance web design and consulting business, and remains involved in politics, elections, and policy campaigns, in his role as a Precinct Committeeman, GOP youth leader, volunteer coordinator, and conservative activist. National memberships Aakash holds include CLUB 100 (Young America's Foundation), the Campus Leadership Program (Leadership Institute), the National Federation of Republican Assemblies, the Republican Liberty Caucus, Students for Life of America, Students for Prosperity, the Campaign for Liberty, Youth for Western Civilization, and a number of other political organizations, in addition to the U.S. Chess Federation, the Sangamon County Farm Bureau, IL Church Action on Alcohol & Addiction Problems, and the India Association of Greater Springfield, as well as the Midwest Coalition to Reduce Immigration (and he sees no conflict between the latter two). Aakash has been a Christian for over nine years, and attends services at iWorshipCenter and Living Word Fellowship. His favorite Bible verse has recently become 1 Peter 4:14, for reasons he needs to be writing about soon.